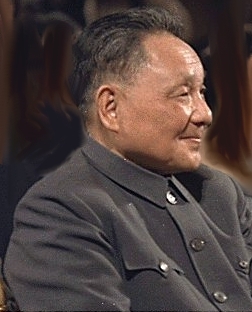 Deng Xiaoping (August 22, 1904 – February 19, 1997) was a prominent Chinese politician and reformer, and a recent leader of the Communist Party of China (CCP). Deng never held office as the head of state or the head of government, but served as the de facto leader of the People's Republic of China from 1978 to the early 1990s. He pioneered "socialism with Chinese characteristics" and Chinese economic reform, also known as the "socialist market economy," and opened China to the global market. Deng is also credited with improving Chinese relations with the West. During Deng's leadership, agreements were signed to return both Hong Kong and Macao to Chinese sovereignty. Inheriting the social and institutional problems left over from the Cultural Revolution and other mass political movements of the Mao era, Deng was the core of the "second generation" Communist Party leadership. Deng's leadership is generally credited with developing China into one of the fastest growing economies in the world and vastly increased the Chinese standard of living. He was, however, unwilling to embrace wide-scale political reform. By opening up Chinese society, the reforms also led to higher crime rates, increased corruption, the loss of traditional values, and growing economic disparity between the rural population and the urban working class. Deng, a Hakka Chinese, was born Deng Xiansheng (simplified Chinese: 邓先圣, traditional Chinese: 鄧先聖) on August 22, 1904, in Paifang village in Xiexing township, Guang'an County, Sichuan Province. While in school, he adopted the name Deng Xixian (邓希贤). In the summer of 1920, Deng Xiaoping graduated from the Chongqing Preparatory School. He and eighty schoolmates participating in a work-study program for Chinese students, boarded a ship for France, traveling steerage, and arrived in Marseilles in October, 1920. Deng, the youngest of all the Chinese students, had just turned 16. He spent most of his time in France working, first at the Le Creusot Iron and Steel plant in central France, then later as a fitter in the Renault factory in the Paris suburb of Billancourt, as a fireman on a locomotive and as a kitchen helper in restaurants. He barely earned enough to survive. He also briefly attended middle schools in Bayeux and Chatillon. In France, under the influence of his seniors (Zhao Shiyan and Zhou Enlai, among others), Deng began to study Marxism and did political propaganda work. In 1922, he joined the Chinese Communist Youth League in Europe. In the second half of 1924, he joined the Chinese Communist Party and became one of the leading members of the General Branch of the Youth League in Europe. During 1926, Deng studied at Moscow in the then-USSR. He returned to China in early 1927. In 1929, Deng led the Baise Uprising in Guangxi province against the Kuomingtang government. The uprising soon failed, and Deng went to the Central Soviet Area in Jiangxi province. His first wife, Zhang Xiyuan, one of his schoolmates from Moscow, died at the age of twenty-four, a few days after giving birth to Deng's first child, a baby girl, who also died. His second wife, Jin Weiying, left him after he came under political attack in 1933. His third wife, Zhuo Lin, was the daughter of an industrialist in Yunnan Province. She became a member of the Communist Party in 1938, and a year later married Deng in front of Mao's cave dwelling in Yan'an. They had five children: Three daughters (Deng Lin, Deng Nan, Deng Rong) and two sons (Deng Pufang, Deng Zhifang). Deng participated in the Long March, serving as General Secretary of the Central Committee of the Communist Party. While acting as political commissar for Liu Bocheng, he organized several important military campaigns during the war with Japan and during the Civil War against the Kuomintang. In late November 1949, Deng led the final assault in his native Sichuan on the Kuomintang forces, which were under the direct command of Chiang Kai-shek. The city of Chongqing fell to the Peoples Liberation Army on December 1, and Deng was immediately appointed mayor and political commissar. Chiang Kai-shek, who had moved his headquarters to Chongqing in mid-November, fled to the provincial capital of Chengdu, the last mainland Chinese city to be held by the Kuomintang. The day it fell, December 10, Chiang fled to Taiwan. When the Peoples Republic of China was founded in 1949, as a supporter of Mao Zedong, Deng was named to several important posts in the new government. Deng was sent to oversee issues in the Southwestern Region, and acted as its First Secretary. After officially supporting Mao Zedong in his Anti-Rightist Campaign of 1957, Deng became General Secretary of the Communist Party of China and ran the country's daily affairs together with then President Liu Shaoqi. Amid growing disenchantment with Mao's Great Leap Forward and the disastrous consequences of his radical policies, Deng and Liu gained influence within the Chinese Communist Party. They embarked on pragmatic economic reforms that bolstered their prestige among the party apparatus and the national populace. Mao grew apprehensive that Deng, Liu, and other moderates were gaining too much influence in the CCP, and launched the Cultural Revolution in 1966, during which Deng, accused of being a “bourgeoisie,” was forced to retire from all his offices. Deng and his family were targeted by Red Guards. Deng's son, Deng Pufang was imprisoned, tortured, and forced out of the window of a four-story building, becoming a paraplegic. Deng Xiaoping was sent to the Xinjian County Tractor Factory in rural Jiangxi province to work as a regular worker. While there, Deng spent his spare time writing. He was purged nationally, but to a lesser scale than Liu Shaoqi. When Premier Zhou Enlai fell ill from cancer, Deng Xiaoping became Zhou's choice for a successor, and Zhou was able to convince Mao to rehabilitate Deng Xiaoping in 1974, as Executive Vice-Premier, in practice running daily affairs. However, the Cultural Revolution was not yet over, and a radical political group known as the Gang of Four, led by Mao's estranged wife Jiang Qing, was competing for control of the Communist Party. The Gang saw Deng as the greatest threat to their power. When Zhou Enlai died in January 1976, Deng lost firm support within the party. After delivering Zhou's official eulogy at the state funeral, Deng was purged again at the instigation of the Gang of Four, though the decision of the Politburo to relieve him of all his posts because of "political mistakes" was unanimous. Following Mao's death in 1976, Deng gradually emerged as the de-facto leader of China. Prior to Mao's death, the only official position he had held was that of Executive Vice-Premier of the State Council. By carefully mobilizing his supporters within the Chinese Communist Party, Deng was able to outmaneuver Mao's anointed successor Hua Guofeng, who had previously pardoned him, and then oust Hua from his leadership positions by 1980-1981. Deng allowed Hua to retain membership in the Central Committee until November 2002, and to retire quietly, helping to set a precedent that someone who lost a high-level struggle for leadership would not be physically harmed or publicly abused. Deng then repudiated the Cultural Revolution and, in 1977, launched the "Beijing Spring," which allowed open criticism of the excesses and suffering that had occurred during that period. By encouraging public criticism of the Cultural Revolution, Deng weakened the position of political opponents who owed their political status to that event, while strengthening the position of those who, like him, had been purged during that time. Deng also received a great deal of popular support. Deng was also behind the abolishment of the “class background” system, under which the CCP put up employment barriers to Chinese deemed to be associated with the former landlord class. Its removal therefore effectively allowed Chinese capitalists to join the Communist Party. As Deng gradually consolidated control over the CCP, Hua was replaced by Zhao Ziyang as premier in 1980, and by Hu Yaobang as party chief in 1981. Deng remained the most influential CCP cadre, although after 1987, his only official posts were as chairman of the state and Communist Party Central Military Commissions. Originally, the office of president had been conceived of as a figurehead, with the actual power of state in the hands of the premier and the party chief. These two offices were to be held by different people in order to prevent a cult of personality from forming as it had around Mao; the party would develop policy, and the state would execute it. Deng's elevation as China's new central figure meant that the historical and ideological questions around Mao Zedong had to be addressed properly. Deng’s reforms were incompatible with Mao's hard-line "class struggle" policies and mass public campaigns. In 1982 the Central Committee of the Communist Party released a document entitled On the Various Historical Issues since the Founding of the People's Republic of China. Mao retained his status as a "great Marxist, proletarian revolutionary, militarist, and general," and the undisputed founder and pioneer of the country and the People's Liberation Army. "His accomplishments must be considered before his mistakes," the document declared. Deng personally commented that Mao was "seven parts good, three parts bad." The document also diverted the primary responsibility for the Cultural Revolution away from Mao, although it did state that "Mao mistakenly began the Cultural Revolution." Instead, the "counter-revolutionary cliques" of the Gang of Four and Lin Biao received the majority of the blame. Under Deng's direction, relations with the West improved markedly. Deng traveled abroad and had a series of amicable meetings with Western leaders. In 1979, he became the first Chinese leader to visit the United States when he met with President Carter at the White House. Shortly after this meeting, the U.S. broke off diplomatic relations with the Republic of China (Taiwan) and established them with the People's Republic of China. Sino-Japanese relations also improved significantly, and Deng used Japan as an example of a rapidly progressing economic power that China could emulate. Another achievement was the agreement signed by Britain and China on December 19, 1984 (Sino-British Joint Declaration), under which Hong Kong was to be handed over to the PRC in 1997. With the end of the 99-year lease on the New Territories expiring, Deng agreed that the PRC would not interfere with Hong Kong's capitalist system for fifty years. A similar agreement was signed with Portugal for the return of colony Macau. Dubbed "one country—two systems," this fairly unprecedented approach has been touted by the PRC as a potential framework within which Taiwan could be reunited with the Mainland in the future. Deng, however, did little to improve relations with the Soviet Union, continuing to adhere to the Maoist line from the era of the Sino-Soviet Split, that the Soviet Union was a superpower, equally as "hegemonist" as the United States, but even more threatening to China because of its geographical proximity. Improving relations with the outside world was the second of two important philosophical shifts outlined in Deng's program of reform, Gaige Kaifang (“Reforms and Openness”). The domestic social, political, and most notably, economic systems underwent significant changes during Deng's time as leader. The goals of Deng's reforms were summed up by the “Four Modernizations” of agriculture, industry, science and technology, and the military. The strategy for developing China into a modern, industrial nation was the development of the socialist market economy. Deng argued that China was in the primary stage of socialism and that the duty of the party was to perfect so-called "socialism with Chinese characteristics." This interpretation of Chinese Marxism reduced the role of ideology in economic decision-making, and gave priority to policies of proven effectiveness. Downgrading communitarian values but not necessarily the ideology of Marxism-Leninism himself, Deng emphasized that "socialism does not mean shared poverty." Planning and market forces are not the essential difference between socialism and capitalism. A planned economy is not the definition of socialism, because there is planning under capitalism; the market economy happens under socialism, too. Planning and market forces are both ways of controlling economic activity. Unlike Hua Guofeng, Deng believed that no policy should be rejected outright simply because it was not associated with Mao, and unlike more conservative leaders such as Chen Yun, Deng did not object to policies on the grounds that they were similar to ones which were found in capitalist nations. We mustn't fear to adopt the advanced management methods applied in capitalist countries (…) The very essence of socialism is the liberation and development of the productive systems (…) Socialism and market economy are not incompatible (…) We should be concerned about right-wing deviations, but most of all, we must be concerned about left-wing deviations. Although Deng provided the theoretical background and the political support which allowed economic reform to occur, it is in general consensus amongst historians that few of the economic reforms that Deng introduced were originated by Deng himself. Premier Zhou Enlai, for example, pioneered the Four Modernizations years before Deng. Many reforms were introduced by local leaders, often not sanctioned by central government directives. If successful and promising, these reforms would be adopted by larger and larger areas and ultimately introduced nationally. Many other reforms were influenced by the experiences of the East Asian Tigers (Taiwan, Singapore, Hong Kong, and South Korea). Deng abandoned Mao's style of launching mass campaigns of economic construction and introduced planned, centralized management of the macro-economy by technically proficient bureaucrats. Unlike the Soviet model, management was done indirectly through market mechanisms. Deng sustained Mao's emphasis on the primacy of agricultural output, and encouraged decision-making on the local level and by individual peasant households. At the local level, material incentives, rather than political appeals, were to be used to motivate the labor force, including allowing peasants to earn extra income by selling the produce of their private plots at free markets. Deng's reforms shifted China's development strategy to an emphasis on light industry and export-led growth. Local municipalities and provinces were allowed to invest in industries that they considered most profitable, which encouraged investment in light manufacturing. Light industrial output was vital for a developing country with a low capital base. With a short gestation period, low capital requirements, and high foreign-exchange export earnings, revenues generated by light manufacturing were able to be reinvested in more technologically-advanced production and further capital expenditures and investments. In sharp contrast to the similar but much less successful reforms in Yugoslavia and Hungary, these investments were not government mandated. The capital invested in heavy industry largely came from the banking system, and most of that capital came from consumer deposits. One of the first items on Deng’s reform agenda was to prevent reallocation of profits except through taxation or through the banking system; this kept state-owned industries more or less independent of government interference. These reforms were a reversal of the Maoist policy of economic self-reliance. China decided to accelerate the modernization process by stepping up the volume of foreign trade, especially the purchase of machinery from Japan and the West. By participating in export-led growth, China was able to quickly take advantage of foreign investment, advanced technologies and professional management. Deng attracted foreign companies to a series of Special Economic Zones, where foreign investment and market liberalization were encouraged. The reforms focused on improving productivity by introducing new material incentives and bonus systems. Rural markets were revived to sell peasants' homegrown products and the surplus products of communes. Not only did the rural markets increase agricultural output, they created a demand for domestically-manufactured goods and increased the political support for more difficult economic reforms. Peasants who were able to sell surplus agricultural yields on the open market had the means to purchase more domestic products, stimulating industrial growth. The Tienanmen Square protests of 1989 began mid-April 1989, following an official visit by Soviet Communist Party Chairman Mikhail Gorbachev, and triggered by the death of Hu Yaobang, the former party General Secretary. Hu was widely seen as a liberal-minded person who had been made a scapegoat for student pro-democracy demonstrations in 1986–1987, humiliated and forced to resign from his position by Deng Xiaoping and other influential leaders of the Politburo. He died of a heart attack on April 15, 1989. The crowds who gathered to mourn his death in Tienanmen Square included many pro-democracy students and many protesters who were disgruntled with the government. On April 18, ten thousand students staged a sit-in in Tienanmen Square. On April 21, one hundred thousand students marched on Tienanmen Square. Demonstrations began to occur all over China, and the protests escalated in Beijing. General Secretary Zhao Zhiyang favored a soft approach to the demonstrations, but most of the Communist Party elders believed that the prolonged demonstrations were a threat to the political stability of China. On May 20, Deng Xiaoping, as chairman of the Central Military Commission, declared martial law, but the demonstrations continued. The decision by Communist party leaders to use of military force caused deep division in the Politburo, and Zhao Ziyang was ousted from political leadership. Even the military was reluctant to oppose the students, and soldiers and tanks from the 27th and 28th Armies of the People's Liberation Army, which were based in rural areas, were sent to take control of the city. These forces were confronted by Chinese students in the streets of Beijing and the ensuing violence resulted in both civilian and army deaths. Estimates of civilian deaths which resulted vary: 400-800, 1,000 (NSA), and 2,600 (Chinese Red Cross). Student protesters maintained that over 7,000 were tortured and killed. Following the violence, the government conducted widespread arrests to suppress, torture, and kill the remaining supporters of the movement, limited access for the foreign press, and controlled coverage of the events in the mainland Chinese press. The violent suppression of the Tienanmen Square protest caused widespread international condemnation of the PRC government. Deng Xiaoping, along with other hardliners, especially Li Peng, were generally blamed for the events. Critics accused Deng of suppressing any signs of political freedom that would undermine the direction of his economic reforms. Deng's involvement in the events of Tienanmen Square showed that he still possessed dictatorial powers, and that the Chinese Communist Party still relied in the use of force and violence to control public protest. Richard Evan's "Deng Xiaoping and the Making of Modern China" points out evidence that the government was confused and conflicted about how to deal with the protests: Deng publicly praised the soldiers involved in the crack-down, but not their military leaders; he scolded Li Peng and Yang Shangkun for “bungling the military operation appallingly;" Jiang Zemin was chosen instead of Li Peng, who had decreed martial law, to replace Zhao Ziyang. Officially, Deng decided to retire from top positions when he stepped down as Chairman of the Central Military Commission in 1989, and retired from the political scene in 1992. China, however, was still in the "era of Deng Xiaoping." He continued to be widely regarded as the "paramount leader" of the country, believed to have back room control. Deng was recognized officially as "the chief architect of China's economic reforms and China's socialist modernization." By the Communist Party, he was believed to have set a good example for communist cadres who refused to retire at old age, by breaking the earlier convention of holding offices for life. He was often referred to as simply Comrade Xiaoping, with no title attached. Because of the Tiananmen Square protests of 1989, Deng's power had been significantly weakened and there was a growing faction officially opposed to Deng's reforms within the Communist Party. To reassert his economic agenda, in the spring of 1992, Deng made his famous southern tour of China, visiting Guangzhou, Shenzhen, Zhuhai, and spending the New Years holiday in Shanghai. On his tour, Deng made various speeches and generated widespread local support for his reformist platform. He stressed the importance of economic construction in China, and criticized those who were against further economic and foreign policy reforms. Deng's catchphrase, "To Get Rich Is Glorious," unleashed a wave of personal entrepreneurship that continues to drive China's economy today. He stated that the "leftist" elements of Chinese society were much more dangerous than "rightist" ones. Deng was instrumental in the opening of Shanghai's Pudong New Area, revitalizing the city as China's economic hub. His southern tour was initially ignored by Beijing and national media, which were under the control of Deng's political rivals. President Jiang Zemin showed little support. Deng penned several articles supporting reforms under the pen name "Huang Fuping" in Shanghai's Liberation Daily newspaper, which quickly gained support amongst local officials and the general populace. Deng's new wave of policy rhetoric gave way to a new political storm between factions in the Politburo. President Jiang eventually sided with Deng, and the national media finally reported Deng's southern tour several months after it occurred. Observers suggest that Jiang's submission to Deng's policies had solidified his position as Deng's heir apparent. On the backstage, Deng's southern tour aided his reformist allies' climb to the apex of national power, and permanently changed China's direction toward economic development. In addition, the eventual outcome of the southern tour proved that Deng was still the most powerful man in China. Deng's insistence on economic openness aided the phenomenal growth levels of the coastal areas, especially the "Golden Triangle" region surrounding Shanghai. Deng reiterated that "some areas must get rich before others," and asserted that the wealth from coastal regions would eventually be transferred to aid economic construction inland. This theory, however, faced numerous challenges when provincial governments moved to protect their own interests. The policy contributed to a widening economic disparity between the affluent coast and the underdeveloped hinterlands. Deng Xiaoping died on February 19, 1997, at age 92, from a lung infection and Parkinson's disease, but his influence continued. Even though Jiang Zemin was in firm control, government policies maintained Deng's ideas, thoughts, methods, and direction. Officially, Deng was eulogized as a "great Marxist, great Proletarian Revolutionary, statesman, military strategist, and diplomat; one of the main leaders of the Communist Party of China, the People's Liberation Army of China, and the People's Republic of China; The great architect of China's socialist opening-up and modernized construction; the founder of Deng Xiaoping theory." Deng’s death was followed by the greatest publicly sanctioned display of grief for any Chinese leader since Mao Zedong himself. In contrast to he death of Mao, the media announced Deng's death without using any special epithets (Mao had been called the “Great Leader and Teacher;” Deng was simply "Comrade"), or any emotional overtones from the news anchors that delivered the message. On the morning of February 24, the people of China were asked by Premier Li Peng to pause in unison silence for three minutes. The nation's flags flew at half-staff for over a week. The nationally televised funeral, which was a simple and relatively private affair attended by the country's leaders and Deng's family, was broadcast on all cable channels. After the funeral, Deng was cremated, his organs donated to medical research, and his ashes scattered at sea, according to his wishes. For the next two weeks, Chinese state media ran news stories and documentaries related to Deng's life and death. There were no people weeping on the streets, no stock market crashes, no business closures, no wearing special armbands of grief, and no interruption to life in general, as there had been after Mao’s death. In the year that followed, songs like "Story of the Spring" by Dong Wenhua, which were created in Deng's honor shortly after Deng's Southern Tour in 1992, once again were widely played. There was a significant international reaction to Deng's death. UN Secretary-General Kofi Annan said Deng was to be remembered "in the international community at large as a primary architect of China's modernization and dramatic economic development." French President Jacques Chirac said "In the course of this century, few men have, as much as Deng Xiaoping, led a vast human community through such profound and determining changes;" British Prime Minister John Major commented about Deng's key role in the return of Hong Kong to Chinese control; Canadian Prime Minister Jean Chretien called Deng a "pivotal figure" in Chinese history. The Taiwan presidential office also sent its condolences, saying it longed for peace, cooperation, and prosperity. The Dalai Lama voiced regret. As a pivotal figure in modern Chinese history, Deng Xiaoping's legacy is very complex and opinion remains divided. Deng changed China from a country obsessed with mass political movements to a country focused on economic construction. In the process, Deng was unrelenting in his use of the political clout of the Communist Party of China, as demonstrated by the 1989 Tiananmen Square Protests. Although some criticize Deng for his actions in 1989, China's significant economic growth in the 1980s and 1990s was largely credited to Deng's policies. In sharp contrast to Mikhail Gorbachev's glasnost and perestroika, Deng's economic “socialist market economy” was a largely novel concept. Deng’s policies, however, also left a large number of issues unresolved, including the unprofitability of state-owned enterprises, regional imbalance, urban-rural economic disparity, official corruption, and the resurfacing of moral evils in a more liberal society, which were exacerbated during Jiang Zemin's term (1993-2003). Although some areas and segments of society were notably better off than before, the re-emergence of significant social inequality did little to legitimize the Communist Party's founding ideals, as the party faced increasing social unrest. Deng's emphasis on light industry, compounded with China's large population, created a large cheap labor market which became significant on the global stage. Favoring joint-ventures over domestic industry, Deng allowed foreign capital to pour into the country. While some see these policies as a fast way to put China on par with the west, Chinese nationalists criticize Deng for embracing too many foreign ideas, to the point where domestic industries are now insignificant. Deng was an able diplomat, and he was largely credited with China’s successes in foreign affairs. During Deng's leadership, agreements were signed to return both Hong Kong and Macao to Chinese sovereignty. Deng's era, set against the backdrop of the Cold war, saw the best Sino-American relations in history. Some Chinese nationalists assert, however, that Deng's foreign policy was one of appeasement, and that past wrongs such as war crimes committed by Japan during the World War II were ignored to make way for economic partnership. When compared to the memorials of other former CCP leaders, those dedicated to Deng have been relatively minimal, in keeping with Deng's pragmatism. Deng's portrait, unlike that of Mao, has never been hung publicly anywhere in China. After his death, he was cremated after death, instead of being embalmed like Mao. There are a few public displays of Deng in the country. A bronze statue of Deng was erected on November 14, 2000, in the grand plaza of Lianhua Mountain Park (Simplified Chinese: 莲花山公园; Traditional Chinese: 蓮花山公園; pinyin: liánhuā shān gōngyuán) of Shenzhen. In addition, in many coastal areas and on the island province of Hainan, Deng is seen on large roadside billboards with messages emphasizing economic reform or his policy of One Country, Two Systems. Another bronze statue of Deng was dedicated August 13, 2004, in Deng's hometown, Guang'an, in southwest China's Sichuan Province, to commemorate Deng's 100th birthday. A boulevard, the Deng Xiaoping Prospekt was dedicated in Bishkek, capital of the Republic of Kyrgyzstan, on June 18, 1997. On December 23, 1969, a band of militia stormed and machine gunned the compound where Deng Xiaoping had been exiled under house arrest in Jiangxi province by executive order of the Chinese Communist Party's Central Committee. The militia mistakenly attacked the guards' residence instead of Deng’s, and many of them were killed when the guards returned fire. The incident was later blamed on Lin Biao, but in the early 1980s, it was decided that Lin Biao was not involved. The case remains unsolved today. On February 21, 1973, an Ilyushin Il-14 was sent from Beijing to Jiangxi to take Deng Xiaoping back to Beijing to resume his work. On the same day, an urgent order from Beijing instructed Deng to take train instead, with the additional protection of a squad personally led by the chief-of-staff of the local military district. It was reported that this change of plan was conducted by Zhou Enlai to protect Deng, and that the Ilyushin Il-14 Deng originally planned to take exploded above Anhui on its way back. This case was never solved. In September 1975, Deng Xiaoping, Jiang Qing, and Hua Guofeng went to Shanxi, and one evening, when Deng was taking his daily walk, a sniper opened fire on Deng and missed. The would-be assassin was never caught and the case became a cold case file. In April 1976, Deng Xiaoping was once again removed from his post and exiled to a military reception center at Yuquan Mountain in a suburb of Beijing. The evening of his arrival, the Number 5 building, where Deng resided, caught fire and burned. Only the first floor, which contained Deng’s room, burned. Deng, however, had been sent by his guards to study Mao's works at another location, and was not in the building when the fire struck. Deng was immediately moved back in to the city. The case remains unsolved. In July 1976, Deng was instructed to go to Chengde, Hebei, to escape the summer heat. Deng refused to go, claiming that he was scheduled to go to the hospital for his annual physical. When the Japanese car assigned to take him on the trip was returned to ministry of defense, it was discovered that the front axle was about to break, and nobody would have survived the consequent crash. The case is still open today. In March 1980, when Deng Xiaoping went to inspect troops in Jinan military region, one of the local guards opened fire on Deng, shouting, “Down with the capitalist Deng Xiaoping! Guard the Chairman Mao's revolutionary thought! Revenge for the vice-chairman Jiang Qing!" Deng was not harmed and the assassin was quickly subdued by his bodyguard. It was discovered the assassin was an ardent Maoist and it appeared that he acted alone; however, most people believed that somebody else had planned the attack. In February 1988, Deng Xiaoping, Chen Yun, and Yang Shangkun went to Shanghai for the Chinese New Year, and stayed in the Western Suburb Hotel. Four men claiming to be a Maoist Combat Team managed to penetrate the security and had a gunfight with the guards. Three were killed and one was arrested. ↑ Jonathan D. Spence, The Search for Modern China (New York: W.W. Norton & Company, 1999, ISBN 0393307808), 310. ↑ John Gittings, The Changing Face of China (Oxford: Oxford University Press, 2005, ISBN 0192806122). ↑ António Caeiro, Pela China Dentro (translated), (Dom Quixote, Lisboa, 2004, ISBN 9722026968). ↑ Matthew White, Minor Atrocities of the Twentieth Century. Retrieved September 24, 2007. ↑ Suisheng Zhao, Deng Xiaoping's Southern Tour: Elite Politics in Post-Tiananmen China (University of California Press, 1993). ↑ CNN, CNN: China officially mourns Deng Xiaoping, February 24, 1997. Retrieved September 24, 2007. ↑ CNN, CNN:World leaders praise Deng's economic legacy, February 24, 1997. Retrieved September 24, 2007. ↑ China Daily, Deng Xiaoping statue unveiled. Retrieved September 24, 2007. ↑ John Pomfret, In Its Own Neighborhood, China Emerges as a Leader, Washington Post. Retrieved September 24, 2007. Zhao, Suisheng. Deng Xiaoping's Southern Tour: Elite Politics in Post-Tiananmen China. University of California Press, 1993. Obituary, NY Times, February 20, 1997. China's former 'first family' (from CNN). This page was last modified on 26 October 2017, at 18:26.